Low lying fog machines create an absolutely stunning effect. Find the fogger that’s perfect for whatever you’re using it for: Halloween, DJing, or magical first dances. Looking to buy a fog chiller? We’ve gathered the best machines and break down the pros and cons of each. There are few things as cool as fog that stays low to the ground! It’s an effect that’s guaranteed to be a hit at any event. Make sure you get low lying fog fluid with your machine – it makes a huge difference! Get what you need HERE. Short on time? Here’s a list of our top picks! Click on any to view. Skip ahead to our in-depth reviews of low lying fog machines: click here. What is a low-lying fog machine? 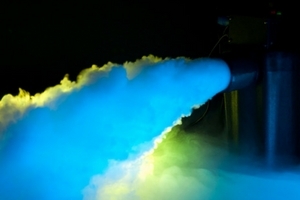 A low-lying fog machine is a specifically designed to create fog that stays low to the ground. Rather than filling the air, these machines create a ground cloud that dissipates without rising into the air. It’s one of the coolest effects around. While there are some differences between a fog chiller and low lying fog machine, we will explain this later. For now, we just want you to be familiar with the general terminology. People use all of the terms above when describing a low lying fogger. Some people prefer to create a low lying fog effect using a standard fog machine – adapted by adding some type of cooling device (more on this later). While this certainly is an option, the convenience and effectiveness of investing in an actual fog chiller is worth considering! If you’re after a high-quality fog that truly sticks close to the floor, go with a product that was designed to accomplish this. 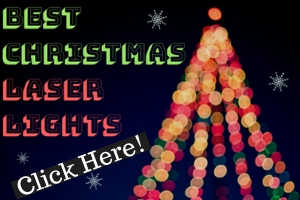 We’ve highlighted some of the best products on the market. At various price points, we think you’ll find one that makes sense for you. The applications for low lying fog machines are as endless as your creativity. Ground fog is a trick you want in your arsenal. Whether you’re a mobile DJ or into production, there are many contexts in which you don’t want fog that fills the room. Maybe it’s because the audience needs to see what’s happening. You might have smoke detectors to worry about. More than anything, ground fog is a unique effect that takes things to the next level. 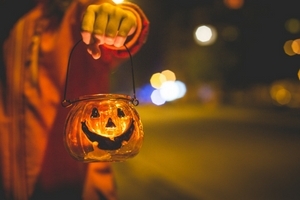 Are you a Halloween junkie? Do you mark October 31st in your calendar and spend the entire year planning new ways to astound and spook your neighbors? This guide will be very helpful for those in this category. Because many Halloween enthusiasts have limited experience with DJ and production equipment. They’re not sure where to turn for trustworthy information on fog machines. A quick Internet search often yields mediocre results. Sorting through all the ads and product pages is tiresome. This guide will help cut through the noise and connect you with the best low lying machines on the market, regardless of your budget. So how do people incorporate fog chillers into their Halloween setups? One of the most popular applications is the front yard graveyard scene. Nothing captures the eeriness of a cemetery setup more than fog that slowly moves along the ground. Meandering neighbors will stop and stare as wisps of fog creep in and around each tombstone. There are many other fun Halloween applications, including haunted houses. Low lying fog allows you to achieve that creepy vibe without completely blinding your guests. Especially indoors, ground fog will stay low without drifting upwards and blacking out your haunted house. People will love the effect as they nervously wind their way through each twist and turn of your haunted experience. People also love to use low lying fog with props. Send fog out of a Jack-o-lantern or witches cauldron. Let it trail creepily out of a front window. Create a blanket of fog underneath a scarecrow that’s mounted in the yard. Take inventory of your scary Halloween decorations and figure out how ground fog might take things to the next level! Sometimes it’s just nice to use low lying fog to bring a dance floor to life! Some people have sensitive respiratory conditions and normal fog makes it hard for them to breathe. Ground fog will usually not trigger this response as it remains low and less is breathed in. If you’ve ever witnessed this type of fog in action, it always gets a positive response from the crowd. People are fascinated by low lying fog and it can bring a burst of enthusiasm to the dance floor. Anytime you’re using fog in a venue, make sure that you’ve cleared it with management first. Every building has a unique fire system and there’s no guarantee that using low lying fog will go undetected. But many times this is the case. It allows you to pull off an incredible fog effect without triggering smoke detectors and having to evacuate the building! A lot of people wonder how low lying fog machines work. What makes the fog stay so low to the ground? The answer lies in the fact that fog chillers do exactly what their name suggests – they cool down the fog. As you probably remember from junior high science class, hot air rises and cool air sinks. Allow us to get nerdy for a second! When you heat air (or any gas), it expands and becomes less dense then the air around it. In this less dense state, the hot air rises and floats in the colder air around it. An analogy for this phenomenon is wood floating in water – since wood is less dense than water it stays on the surface rather than sinking. When air cools down the opposite effect occurs – the air becomes more dense and tends to sink instead of rise. This is exactly what happens in a low lying fog machine. Once the fog is cooled down by ice in the machine, it is denser than the air around it, so it sinks to the ground. See the diagram below. Dry Ice vs. Regular Ice? A lot of people wonder what type of ice works best with their fog chiller. While there isn’t a one-size-fits-all answer, here are a few things to consider. The main principle is: if you want great results, make sure you have a high-quality machine. It doesn’t have to cost you a fortune and will produce the perfect ground fog effect you’re hoping for. Many fog chillers only require regular ice. An obvious benefit is it’s convenient to find and inexpensive. 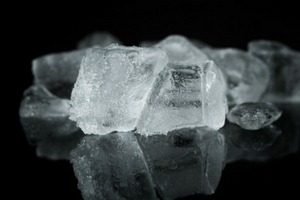 You can rest assured that you’ll always have plenty of ice to fill your machine. With a solid machine, the fog produced will look great and stay low. The fog will not be quite as cold as when using dry ice. Although it will still hug the ground, in some outdoor environments with wind fog might disperse and drift upwards into the air. Regular ice obviously melts faster. So if you’re running your fogger for an extended period of time, this means more frequent ice refills. You will also need to drain the excess liquid from your machine – more so than with dry ice. Luckily, many products include a drain system and excess liquid bag which makes this task manageable. The good news is, most fog chillers are compatible with both regular and dry ice. Above all check with the manufacturer to confirm this. Due to its extremely cold temperature, dry ice can be harmful when it comes in contact with skin. Be very careful when handling it and follow appropriate safety guidelines. Always wear protective clothing and gloves to ensure you’re as safe as possible. Dry ice can be harder to find. Especially if you’re using dry ice pellets, which are convenient to load into a fogger, many stores require you to buy a large quantity. If you’re using a smaller machine, you may not desire to buy such a large amount, in which case you’ll have to crush a dry ice block yourself. One last consideration when using dry ice is price. Obviously you will pay a bit more for it than regular ice. However, the results may make it worth it. To get a feel for the difference between using dry ice and regular ice, check out this video. You can see how dry ice creates thicker, lower-lying fog. Whichever route you go, just make sure you’re using a quality machine that is intended to produce ground fog. You can’t go wrong! Can I Get Low Lying Fog From a Regular Machine? Yes, you can get low lying fog from a regular fogger, but there’s a few things to keep in mind. If you own a standard fogger and want to produce ground fog, you should not fill your machine with low lying fog fluid. This has the potential to damage or clog your machine. Low lying fog formulas are generally more dense and specifically designed to use with fog chillers only. A regular fog machine is not designed to produce low lying clouds. So simply pouring a different kind of liquid into it will make no difference. The key to creating your desired effect is cooling the fog down. Using low lying fog is a lot of fun, but it can also be frustrating for beginners. Maybe the fog isn’t as low to the ground as you hoped. Maybe strong wind is killing the vibe you wanted to pull off. We’ve gathered some of our best advice on using ground fog. Get the most from your machine and have a blast! Nothing destroys the cool effect of low lying fog like wind. Although ground foggers will cool down the fog, wind will drive it up from the ground, or at the very least disperse it. For best results use a fog chiller indoors. For graveyard scenes or other outdoor applications, invest in a timer and set the fog output at a low interval. Even light wind can dramatically impact how much fog sticks around, so make sure to adjust accordingly. Also, try to shelter the fog from wind by placing the machine next to a wall or behind a bush. If it’s a super windy night, you may just be out of luck! In outdoor applications, take note of the weather. Why does this matter? Because the outside temperature will impact how effectively fog stays on the ground. As discussed earlier in this article, warm air is less dense and rises while cool air is more dense and sinks. Releasing cold fog into warmer air will produce ideal results, since the fog is heavier (denser) and will easily sink to the ground. If it’s a really cold night, know that your ground fogger may not perform as well. Regardless, if you’ve invested in a great machine and fog fluid, you should still see great results. Due to the thick composition of low lying fog fluid, sometimes buildup can accumulate within the pump or nozzle. This is normal but requires some easy maintenance. Cleaning a fog machine is easy! Use a reputable brand’s cleaning solution and run it through your fogger for around 5 minutes. For more details on how to clean your fog machine, and for recommendations for cleaning solutions, see our buyers guide for fog fluids here. Whenever you’re using fog, smoke detectors can be a serious hindrance. 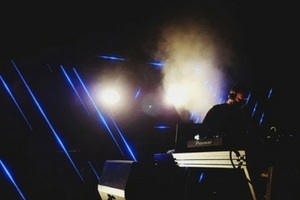 Many venues don’t let mobile DJs use fog for this reason. Even if you’re throwing a party at your house, the last thing you want is an annoying smoke alarm interrupting the fun. Thankfully low lying fog is less likely to trigger alarms. However, be aware of the ventilation in the room where you’re using fog. Are there any fans running? Will wind from the outside be let in? For whatever reason, if low lying fog is dispersed throughout the air rather than sitting on the ground uninterrupted, there’s a greater chance that fire alarms might be triggered. Make sure you know the venue and conditions before using your machine. One unique aspect of fog chillers is their need to drain excess liquid. Since they utilize ice to cool down fog, when the ice melts the excess water is slowly drained into some kind of container. Every low lying fog machine has this feature. Our advice? Make sure all connections are secure to avoid water leaking out and causing trouble. If a puddle forms under or around your machine, this is an electrical hazard and also creates a dangerous, slippery surface for people walking by. If your fogger uses an external drainage bag to hold excess water, set it upright in a safe place. Check on it periodically to ensure no water is leaking. Click on any images to see Amazon pricing! The American DJ Mister Kool II is an affordable and portable way to create a low lying fog effect. Ditch the complications of dry ice or Co2 effects! Over 10 years ago ADJ introduced the original Mister Kool and it’s been a best-seller ever since. 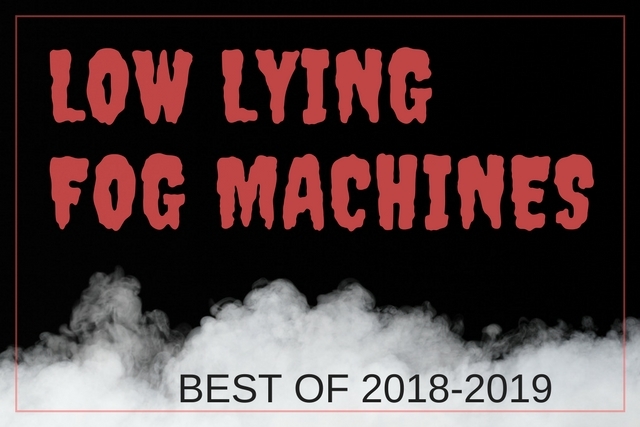 Whether you’re a Halloween junkie, mobile DJ, or production company, this machine produces incredible ground fog that stays low and looks great. The Mister Kool II features a chiller box that holds up to 4 lbs of ice. Fog passes through this chamber and is cooled, then exits the machine in low lying fashion! It is capable of over 8 minutes of continuous output and has a three minute warmup time, making it ideal for dance floors and rooms of any size. ADJ has created a special fluid for this machine called Kool Fog. This formula creates optimal ground fog, but smells good! While some reviewers wouldn’t include this detail, if you’ve ever suffered through fog that smells terrible, you understand why. 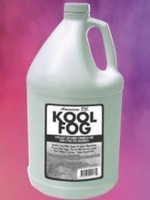 Kool Fog will not clear the dance floor because of a terrible odor, but has a subtle aroma that is non-intrusive. Increased Output: Mister Kool II puts out 3,000 cubic feet per minute (up from 2,500 in the original model). An extra 500 feet comes in handy. In fact, if we have one critique of the first version, it’s that the output was slightly lacking. ADJ answered the call and put some extra power into the new unit. Heater Upgrade: Mister Kool II also features a 700 watt heater (increased from 400 watts in the original). This product includes a simple and effective water drainage system, to collect water from the melted ice. 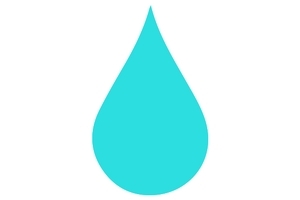 An easy on/off valve controls whether water is allowed to drain or not. 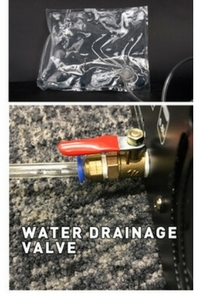 A clear plastic hose guides excess fluid to a durable collection bag. When you’re gig is over, simply remove the bag, empty it, and you’re done! Tip for use: make sure the drainage valve is open and place the bag lower than the machine. This will help water to flow freely and not back up in the ice chamber. The Mister Kool II comes with a 12-foot wired remote, making it easy to control the output and frequency of fog. These remotes are incredibly useful and allow you to lock in your fog machine settings, walk away, and enjoy hours of use. Mobile DJs will definitely enjoy this feature. If you’re throwing a party, you’ll be free to walk around, dance, and greet your guests instead of tending a fog machine all night. 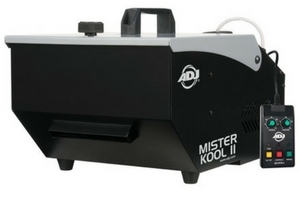 If you’re looking for a reasonably price low lying fog machine, and don’t need to produce a massive volume, ADJ’s Mister Kool II is ideal. For it’s price, nothing else on the market really even comes close. Portable. Convenient. Sturdy. Although this unit was designed to use regular ice, it is also compatible with dry ice. The results will be a denser, lower-lying fog that dissipates more slowly. The included remote makes your job easy – just check in every once in a while to check your fluid and ice levels. We highly recommend this product for DJs, house parties, Halloween events, weddings, productions, and anything that requires a high-quality ground fog effect. The Antari Ice 101 is an incredible low lying fog machine that uses regular ice. With a 1,000 watt heater we labeled it a “medium output” unit, but this sucker is definitely powerful enough to fill a large dance floor. If your goal is to create lots of ground fog for an extended period of time, this machine is worth a close look. For a visual of its output, watch the videos below. The Antari Ice 101 uses regular ice cubes, although you can use dry ice if you prefer. Thanks to a large chilling tank that holds up to 22 lbs of ice, it creates dense, white, low lying fog. 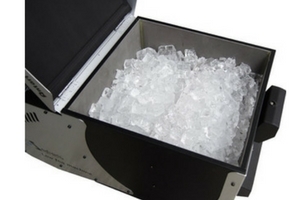 You can store ice in the compartment for up to 8 hours. When run continuously, ice will last for approx. one hour. In the category of ice-based foggers under $1,000, this one emerges as a champion. If you have no interest in dry ice or c02, the Antari Ice delivers powerful results with regular ice. With a warmup time of 4.5 minutes, just plug it in and you’re ready to go! The Antari Ice 101 can be controlled via 3-pin XLR cable. This allows you the convenience and versatility of controlling the machine from a distance. For those not using DMX, this unit comes with the Z-8 timer remote. 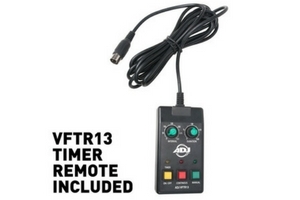 Control options on this remote include setting the interval between fog blasts, duration, and output level (0-100%). Every fog machine using ice includes a draining system, and this is where the Antari Ice 101 really stands out. Its drainage pump can be activated manually or set to automatic. This frees you up from having to worry at a gig or party about whether the machine is draining properly. 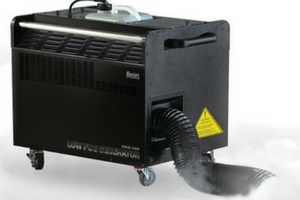 This fog chiller boasts an output of 1,400 cubic feet per minute. As you’ll see in the videos below, it will fill an entire banquet hall, dance floor, living room, or any indoor space effortlessly. Although the Ice 101 is significantly more expensive than ADJ’s Mister Kool II, its output is continuous. The Mister Kool technically has a higher output of 3,000 cubic feet per minute, but it often pauses to reheat. The Antari Ice 1o1 provides continuous fog that won’t let up! This comes in handy if you’re looking to fill a larger space. The Antari Ice 101 has a 2.5 liter tank and consumes 1 liter in 40 minutes (contrast with Mister Kool II’s consuming 1 liter in 14 minutes). This fogger will hang in there for long gigs or parties. You get what you pay for, and in the case of the Antari Ice 101, you’re paying for an excellent low lying fog machine that has the heating power (1,000 watts), fluid capacity (2.5 liters), and continuous output necessary to fill large spaces. And all this simply using ice! It offers the controllability of DMX but also comes with a wired timer remote. For those who might be interested in learning DMX, this unit will allow you to do so. Trigger fog exactly when you want it. Create moments on the dance floor that fit the moment and excite clients. Any drawbacks? Not really, but be aware that this fog machine weighs 53 lbs! Although it’s often operated on the ground, make sure you’re up for lifting this unit if necessary. 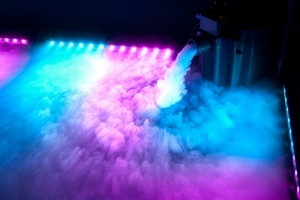 The Chauvet Nimbus has absolutely dominated the industry when it comes to dry ice machines. This fogger is designed to create short but powerful bursts of thick, white, low lying fog. 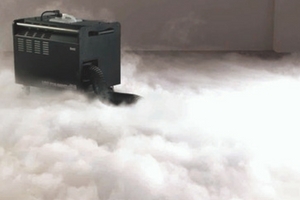 After heating up this machine uses 10 lbs of dry ice to create a powerful blast of fog up to 6 minutes. If you’re looking to pull off a dramatic and beautiful ground fog effect, take a look at the Nimbus. A lot of DJs use it to blanket the floor at weddings during a couple’s first dance. It can also be used to cover a stage or gym floor – the possibilities are endless! So how does this machine work? 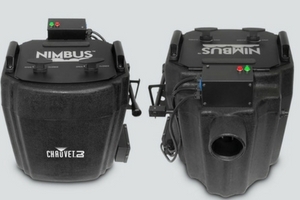 The Chauvet Nimbus utilizes dual heaters to heat up 4.5 gallons of water. An internal basket holds up to 10 lbs of dry ice. Using an easy-to-use lever, simply lower the basket of dry ice into the hot water, and loads of beautiful fog come out the nozzle. Unlike standard foggers, the Nimbus is absolutely silent when operating and ideal for first dances at weddings. It definitely outshines ice-based low lying machines – in terms of its high output and the low-lying nature of the fog. This unit is perfect for those who want to fill a room quickly but not continuously. What do we mean by “fog quality?” We’re referring to density. Dry ice creates fog that is remarkably cooler than what’s produced in a typical fog machine. It’s more dense, hangs lower, and dissipates without rising into the air. So if you’re using the Chauvet Nimbus at a wedding reception or fancy event, one in which you don’t want fog getting in people’s eyes or triggering fire alarms, rest assured! This unit heats water to a max temperature of 175 degrees Fahrenheit, creating a safe and brilliant dry ice reaction that makes for exceptional fog. One potential drawback of this unit is its long warmup time. You can choose whether to heat water inside the machine using one or two heating elements. It takes 50 minutes to heat up using one, and 30 minutes using two. With a little careful planning this is not a big issue. But know that this is not a plug and go fogger. It’s meant to create a short-lived but beautiful low lying fog effect – up to 6 minutes. The Nimbus’ fog output is controlled using a lever. To release fog, simply move the lever into either the low or high output level. This machine is intended to be used manually and does not have DMX capabilities. The lever is sturdy and easy to use. For those worried about the safety of using dry ice, the Nimbus includes a water level and heater sensor. Once the water has reached its optimal temperature the heating elements will automatically shut off to avoid overheating. If you’re looking for a high-quality, easy-to-control dry ice machine, the Chauvet Nimbus is unsurpassed in its price range. Flood a dance floor with ankle-deep, white, billowy fog that won’t rise into the air. Enjoy peace of mind at gigs thanks to safety features like dual heaters that automatically turn off when needed. Make sure you check out the product videos and reviews below to see this machine in action. 1. When full of water, this fogger is heavy (75 lbs). Make sure you are physically able to transport something this heavy. You can transport the machine without water to the gig, then fill it up on location. 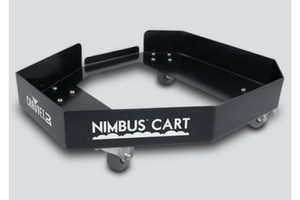 Chauvet has made things easy with the Nimbus cart, which is sold separately. 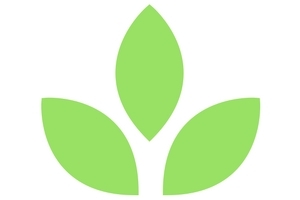 Click on the picture below to check it out! 2. The second thing to consider is heat up time. 30 minutes is not a big deal, especially since most DJ setups take several hours. You can plug in your Nimbus when you arrive, leave it, and it’s ready to go. But if you have no need for a short and dramatic dry ice effect, and prefer a unit that functions more continuously over longer periods of time, consider the ADJ Mister Kool or Antari Ice-101. Meet the Chauvet Nimbus’ Younger Brother! 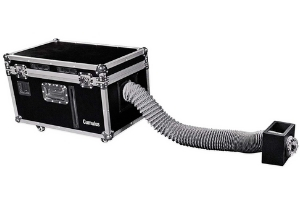 Chauvet has created a compact version of their dry ice machine. They’ve named it the Nimbus Jr. It provides a great low lying fog effect with slightly less output than the larger version. It’s reheat time is only 10 minutes, allowing you to repeat the fog effect in a shorter amount of time! It’s about $400 cheaper, more lightweight, and has a faster warmup time. 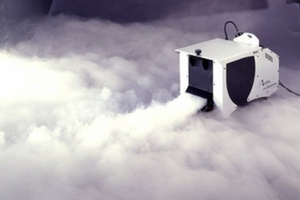 This dry ice machine is ideal for small and medium-size venues. If you want to experiment with dry ice fog, this is a perfect machine to invest in. Already own a fog machine and don’t necessarily want to purchase a separate one just for low lying effects? There are a lot of DIY projects online that teach you how to adapt any fog machine into a chiller. As mentioned earlier, in order to achieve ground fog you must cool it down. There are a lot of ways to do this and it can be a fun project with satisfying results. 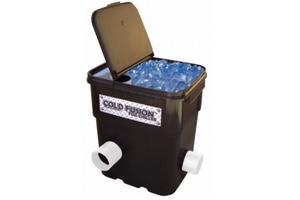 Some people use metal hosing, ice chests, coolers, and even trash cans. If you’re interested, check out the DIY fog chiller instructional videos (featured above in this article). We love and encourage creativity with homemade fog chillers, but we’d be amiss not to highlight some professional DIY-style chillers. These products are made from top-notch materials, will do an incredible job cooling down fog, and will maximize the machine you already own! Why go with this type of fog chiller? If you’re deciding between buying a low lying fog machine or a fog chiller, there’s a couple reasons why you might go with the latter. For one thing, you can achieve the same effect with any standard fog machine. Just place the output nozzle into the ice chamber, then watch as cool ground fog emerges from the chiller. Fog chillers are easy to use and great for parties, Halloween displays, and indoor stage productions. They also tend to be more affordable than a low lying fog machine. Throughout this article we’ve referred to a low lying fog machine as being synonymous with a fog chiller. Most people use the terms interchangeably, but for clarity it’s time to distinguish between them. So what’s the difference? The Vortex Fog Chiller Cold Fusion is made by Froggy’s Fog, one of the best fog fluid manufacturers around. Most of their products are centered around fog juice, but they’ve created some great fog chillers as well. The Cold Fusion can accommodate foggers with an output reaching 10,000 cubic feet per minute. Load this baby with up to 20 pounds of ice, then watch as plumes of low lying fog drift out. According to Froggy’s, this unit carries enough ice to produce 7 cubic miles of low lying fog! It uses a multi-patented VEST system (vortex endothermic sublimation technology) to crank out fog up to 30 feet away! Don’t ask us to explain VEST… all we know is this sucker works great! This product offers an effective and affordable way to create low lying fog, without having to buy a machine. It’s a fantastic way to delve into the world of ground fog, experiment, be creative, and satisfy your clients. Have fun with this one! 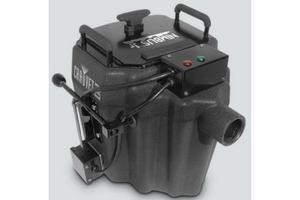 The Vortex Fog Chiller Blizzard is a powerful tool to use with any fog machine. It can accommodate a fogger with an output up to 25,000 CFM (cubic feet per minute), so needless to say it provides excellent coverage. If you’ve invested in a high-quality fogger, don’t waste money on a less powerful low lying fog machine. Just plug the one you’ve got into the Blizzard and enjoy incredible ground fog. This Blizzard holds up to 36 lbs of ice, which serves to cool down fog instantly and effectively. It will maximize the output of the machine you already own, increasing fog volume up to 500%. If paired with a high-output fogger, this chiller will shoot fog up to 80 feet away! 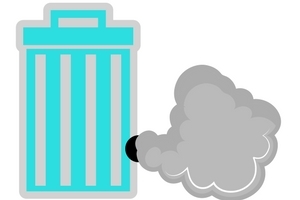 It’s capable of producing up to 7 cubic miles of fog on a single use! Obviously this will vary based on what fog machine you’re using, but regardless expect great results. The Blizzard is adaptable to virtually any scenario. 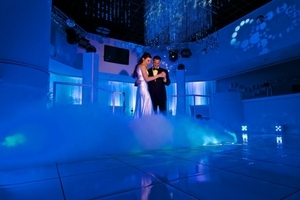 If you’re looking to cover a small dance floor or stage, simply use it alongside a medium-powered fogger. 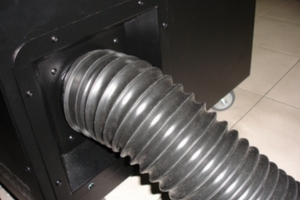 If you need to blast low lying fog throughout a larger space, use a machine with a higher CFM output. The versatility of this product makes it ideal for any size endeavor. To achieve similar results, in terms of fog density and volume, you’d usually spend a lot more (some comparable units reach prices of $10,000 or more). For a few hundred bucks you get a professionally-designed, highly effective, adaptable product that will deliver incredible fog every time. 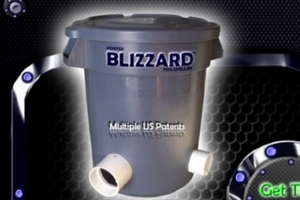 The Blizzard is easy to transport, set up, and operate. We highly recommend it to anyone considering the fog chiller route. 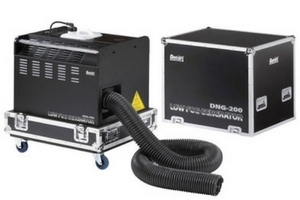 The Antari DNG-200 is an absolute powerhouse in the world of low lying fog machines! Ruggedly built to weather the bumps and bruises of life on the stage and/or road, this machine produces 2,800 cubic feet per minute of continuous fog! If you’re looking for a professional ground fogger for a production, school dance, mobile DJ setup, theme park, or anything in between, take a look at some features the Antari DNG-200 offers. This fog machine was built by professionals for professionals. If you’re in the market for something ultra-durable and efficient, the DNG-200 delivers. After a warmup time of only 24 minutes, enjoy a continuous, uninterrupted fog output of 2,800 cubic feet per minute. With a tank capacity of 10 liters you can generate fog nonstop for almost two hours (the DNG-200 consumes 1 liter of fluid in 11 minutes). Forget the hassle of regular or dry ice – just fill up the tank with fluid and go. This unit is DMX compatible giving you ultimate control over its output volume and duration. The Antari DNG-200 is built to withstand the rigors of the road. 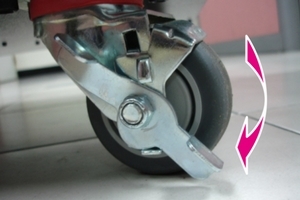 It includes wheels that lock in place, which prevents the unit from sliding when bumped. A quick lock and release system makes the process simple and safe, especially in an environment in which lots of people are moving around the machine. The DNG-200 also features sturdy handles so you can roll it into place easily. A major concern with any fog machine is how it will affect people’s respiratory systems, as well as the environment. Many low-quality brands cut corners and their products create unhealthy byproducts. The DNG-200 is safe for the environment and releases fog similar to what you’d get from dry ice. Make sure to use a well-made fog fluid for the best and safest results. Rest assured, this low lying fog machine will optimize your performance without putting others at risk. As you would expect from a professional-grade fogger, this unit is DMX ready. Enjoy 100% control of the fog output on this machine. On the back side you will find both a 3-pin and 5-pin DMX connector. Get the most out of what you do by customizing and timing fog bursts and duration, even from a distance. Especially in the production world, it’s important that fog gets delivered exactly where you want it. Without this level of control, your effect might fall flat. The Antari DNG-200 uses a 3-meter hose output so you can direct fog to the right location. You can adjust the direction as well as distance from the machine. This is indispensable for creating and customizing really cool ground fog effects. 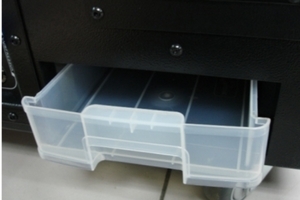 Another great feature of this product is a built-in water collection tray, which is located on the back. This is designed to catch any excess moisture emitted during operation. It slides in and out easily so you can empty it as needed. When you’re in the middle of a DJ set or production, the last thing you want to worry about is fluid levels in your fogger. The Antari DNG-200 includes a pump temperature sensor. When fluid is running low in the tank, the pump senses an increase in internal temperature and shuts off automatically. This helps avoid any unnecessary damage to the machine and gives you peace of mind. Focus on what really matters in the moment without having to constantly monitor your fog machine. 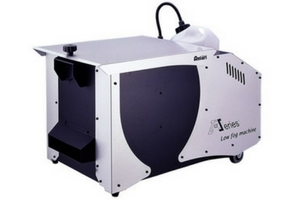 The Antari DNG-200 features a highly powerful 1,400 watt heater. This ground fogger puts out continuous fog with no pauses or re-warmup times. This is an obvioius benefit – when you need fog it’s always there. As long as there’s fluid in the tank you can count on the DNG-200 to produce wonderful low lying clouds of fog. With an output of 2,800 cubic feet per minute, this unit is capable of covering vast areas. The Antari DNG-200 has the durability, controllability, and output to stand up to any production challenge. For those willing to make a lasting investment, this product will deliver beautiful low lying fog for years. Excellent safety features like locking wheels, sturdy handle, environmentally friendly fog, and an internal pump sensor, you can rely on this unit to perform well every time. The option of continuous fog output is indispensable as you won’t have to slow down or wait for multiple warmup times. With an output of 2,800 cubic feet per minute, blanket any size space quickly and efficiently. Enough said! We encourage you to check it out for yourself. Question or comments? Hit us up!